Honestly, I have yet tasted a baked coconut mooncake before. This coconut mooncake is actually quite popular in China. Though I have no idea where this recipe is originated from, I would love to give it a shot. 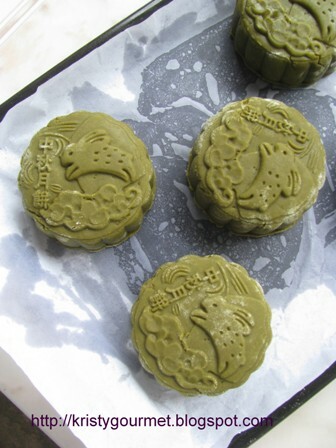 It sounds pretty weird, you know, by matching the grated coconut into mooncake. 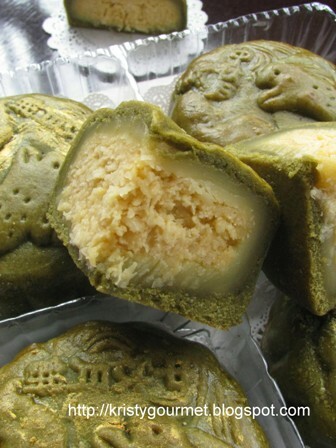 Surprisingly, hubby became the biggest fan of this special mooncake now. >o< And finally, here's the recipe I came up with after checking out a few Chinese recipe blogs. Or you may check out other from here. (1) stir together sugar & warm melted butter till well combined. (2) now, bring in all the ingredients and mix to form soft sticky paste. 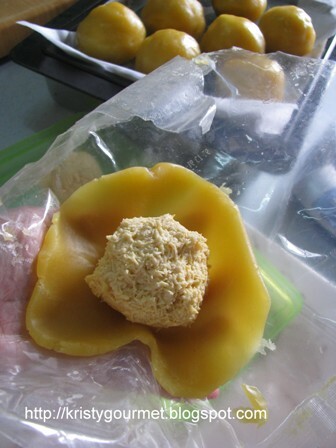 (3) then divide into 5 portions and squeeze & round it into a ball shape then keep refrigerated to set before used. * This can be prepared a day before. *You may need more fluid if you're using desicated coconut which is dry & hard. As this is my first attempt using the coconut fillings, I really want to secure it with some dou yong paste. So, decided to wrap it with a thin layer of dou yong paste, about 60gm each. Its best to flatten it between a plastic sheet. Make sure everything is nicely press & sealed. (1) stir together syrup, cooking oil & lye water and let to sit for an hour. (2) when ready, stir liquid mixture into dry ingredients to form a soft dough then again let to rest for another one hour. (3) now, divide dough into 5 portions & flatten it between a plastic sheet which is more proper. Then fill in the coconut filling and wrap the whole thing up. Make sure its perfectly sealed. 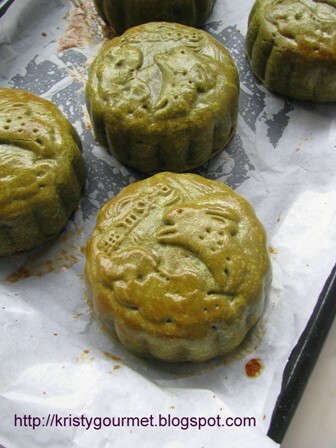 (4) coat a bit of flour all around the dough and press it with a mooncake mould then place it to baking tray lined with parchment paper. (5) next, bake at preheated oven 160'C for 10 minutes with door ajar. (6) remove from oven and let it cool for 10 minutes before brush on the egg glazing. (7) finally, place it back to the oven again and bake for another 10 minutes with door ajar till nicely brown. I decided to brush on some golden dust to give the mooncake an expensive look. Well, not exactly what I'm expecting though. It looks weird ! haha.... Anyway, hope you guys will love it. Enjoy & have a great week ahead everyone. Today is our NATIONAL DAY, so wishing all the Malaysians HAPPY MERDEKA DAY ! 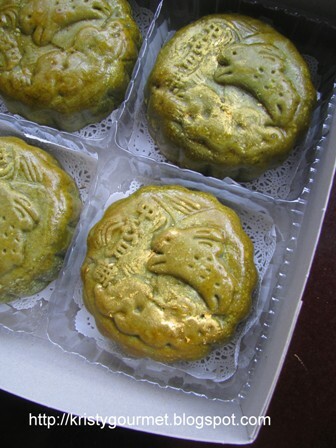 I am not really a big fan of mooncake, but this one is really special with coconut filling and matcha skin. Well done, Kristy. I really need to start baking mooncakes soon! Your mooncakes look all so good. Regarding your question about linking your published post with us, are you referring to a post that you published just 2 days ago? If no, we prefer not. Sorry! Looks nice with the golden dust. Coconut custard sounds unique!